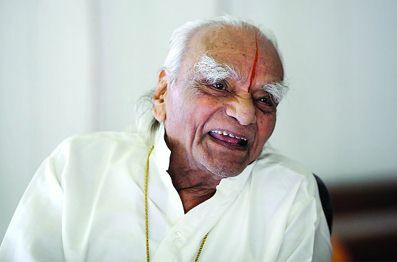 It is with great sadness we in the Ottawa Iyengar yoga community mourn the passing of our Guruji, Bellur Krishnamachar Sundarajara Iyengar on August 20th, 2014 at the age of 95. He was considered the foremost yoga teacher in the world and was often referred to as “the father of modern yoga”. Guruji, who was our inspiration and guiding light, was a humble man who gave unstintingly of his teaching. His legacy will live on through his books, CD’s, videos and the thousands of his teachers throughout the world. He was a happy and contented man who lived his life through yoga. Centuries will pass before another yogi of his calibre will walk among us. May he be at peace. Sadly, and with heavy hearts, we must let you know that Sri BKS Iyengar, our Guruji, has passed away. After a brief stay in hospital he has left this life. We have all been blessed by his presence, directly or indirectly, and we are immensely and forever grateful for his generosity of spirit. Our thoughts and prayers are with his family at this most difficult time. “Without consideration of caste, class, creed, religion or region, it is said that the only royal path is yoga. This alone is the path that purifies the seeker of truth and no other.